Shelley Says: Damn Those Ice Dams! Water finds the easiest path of resistance which is why many of us have had water in our homes after the ice formed on our roofs. The Ice Dam is to blame. Once an Ice Dam is formed you will have a problem. What is an Ice Dam anyway? An Ice Dam is a ridge of ice that forms at the edge of a roof and prevents melting snow (water) from draining off the roof. The water that backs up behind the dam can leak into a home and cause damage to walls, ceilings, insulation and other areas. All this is either because of heavy freezing rain or moderate or heavy snow conditions with an air temperature significantly below freezing. In some cases, the cause is the attic below the roof, which needs to be cold. When heat from the house escapes to the attic, the warmer air is now under the roof and will add to the problem, since the ice will start to melt in the exact place you don't want it to be melting. The first thing that you need to do is remove snow from the roof. 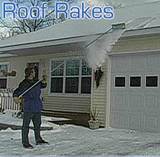 A "roof rake" can be used to remove snow but you need to be careful not to damage the roofing material. If you can't get all the snow off, at least move it away from where the shingles meet the walls of the house and far enough down the roof so you clear areas where there is a wall under the roof line. The goal is to have as little ice and snow on the roof to minimize the amount of water entering the house if an Ice Dam does form. Try filling pantyhose with Potassium Chloride Pellets, which are gentle enough to not ruin wood shingles but slow acting as far as melting the snow. (There are many other products available, but make sure you are not using anything which will ruin your roofing material.) If you were to just throw the pellets onto the roof, they could roll off and not do much good. The pantyhose is placed on the areas where you need the pellets to stay put. I found a "snow sock," which looks pretty good and is pictured above, especially if you don't happen to have pantyhose. You could also use something as simple as just a sock. In the end, when we know that weather conditions make it next to impossible to avoid the formation of an Ice Dam, the least we can do is to try to mitigate the damage. I Am Morning Woman, Hear Me Roar!